FIFA 2014 World Cup Brazil: Who are the Real Winners? When FIFA elected Brazil to host the 2014 FIFA World Cup, I shared the elation of the Brazilian people. I saw it not only as an opportunity to showcase Brazil’s economic growth, but also the warmth and hospitality of its people. Almost a year later, the global economic crisis changed our world. Even though Brazil recovered faster than many other economies, the world market for its products had changed. Private funding shriveled. Of the twelve host cities for the World Cup football (US soccer) games, only three cities – São Paulo, Curitiba, and Porto Alegre – raised private funds for their construction projects. Even then, those cities depended upon financing from state banks and government fiscal incentives. According to figures released in May 2014, Brazil’s total investment in the World Cup amounted to US$11.6 billion (R$25.6 billion). More than 83 percent came from taxpayers’ money (see details). Thanks to corruption at all levels of the government, construction costs overshot the goal. A study done by Brazilian sports business consultants, PluriConsultoria, revealed that the medium cost per seat of Brazil’s new stadiums is 15 percent higher than the 66 stadiums constructed worldwide since 2004. In figures, that’s equivalent to US$6,720 compared to US$5,841 per seat. 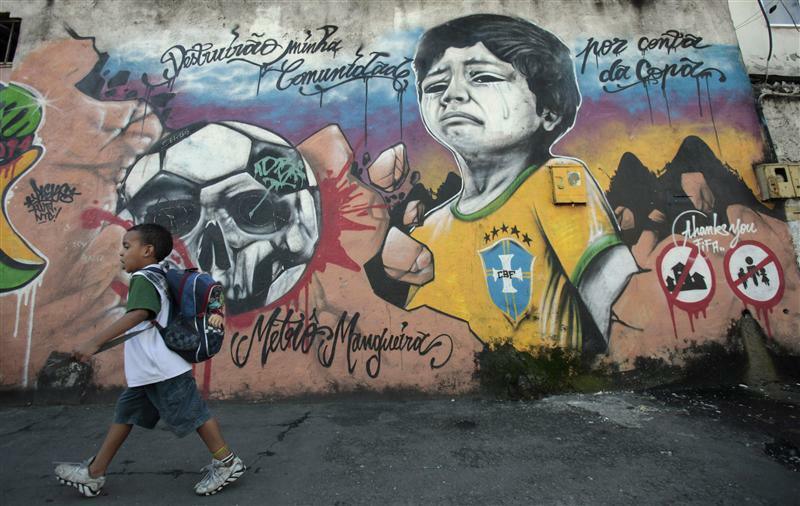 Government corruption and excessive spending for the World Cup infuriated the Brazilian people. They took to the streets. Their government was squandering money needed for more schools, hospitals, housing, and transportation. Anger grew, too, with the displacement of residents from favelas (poor, working class communities) to make way for new sports facilities, parking lots, bus routes, and improvements in tourism infrastructure. Families living in those communities for decades were devastated (see video below). Since falling in love with Brazilian football, I have cheered and agonized while watching my favorite teams play in the last six World Cup games. This year, the great year for Brazil football, is different for me. Football has lost its enchantment.